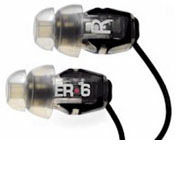 The ER-6 Isolator earphones provide outstanding sound quality and isolation in a lightweight, compact package. If you are a Motorcyclist....you know how much ear plugs matter on any long distance run...These take the place of plugs (even better) and the quality of sound is equal to any high-end speaker system I have heard. Best 100 you can spend....after a Russell seat!!!!!! I did a lot of online research and actual testing of a number of ear buds for my Ipod. Basically, I wanted the best possible sound reproduction while also reducing the noise of airplane engines, trains, cars and other sounds. The other products I tested include the Ultimate Ear, Radio Shack noise reducing ear buds, Shure EC3 and, of course, the ear buds that came with the Ipod. I finally settled on the Etymotic ER6i's due to their reasonable cost and excellent sound. Like other reviews of this product indicate, getting a good tight fit of the ear buds in one's ears is the key to getting the best noise reduction and full/clean bass response. In fact, since the silicone tips and foam cushions that came with the ear buds were not really snug in my ear canals, I went ahead and ordered the larger foam tips from the Etymotic web site (3 pairs for $20 including shipping), which by the way, arrived in only three days after I ordered them. At any rate, with the larger foam tips fitted, I must say, these are the finest fitting and sounding ear buds I have ever used. The clarity of the lows, mids and highs is excellent and would be pleasing to even the most demanding audiophile. Due to the snug fit, you can't even hear normal conversation very well at all and most load sounds such as jet engines are definitely tolerable to the point I find myself keeping the volume at a low to moderate level which is definitely better for my hearing. As I write this review I am listening to Steely Dan's Aja and it sounds like the band is playing live inside of my head. So....if you want a great pair of ear buds for a reasonable cost and that boasts excellent sound and noise reduction abilities, I would definitely recommend giving these a try! They seem a bit delicate build quality wise, but for their size, that is expected. Midrange may be a bit overemphasized, but EQ'ing can fix that easily. Don't have boomy midbass if that is the sound you like (but the low end bass extension is good). I am reviewing the ER-6i black model. I purchased these In Ear Monitors primarily for use during air travel. I listen mostly to rock and electronica, but also classical and general pop. I am somewhat of a "basshead" so the reports of thin bass were a concern before I purchased these, but luckily, I found that reputation to be totally unfounded (perhaps thin bass is more associated with the non-i ER-6 model, as the i model reportedly has enhanced bass response). I was also concerned about the potential discomfort associated with inserting these monitors, however, I had no problem fitting them in my ears and obtaining a good seal. Etymotic should be commended for the array of different tips they include in the packaging. Personally, the default 3 flange rubber tips work great for me. I can insert them quickly and obtain complete isolation. Earlier this week I was on an airline flight on a very noisy regional airliner with a screaming baby in the row in front of me. As soon as I inserted the Etymotics and turned on my MP3 player, I heard none of it. I was amazed at how much noise they were blocking when I took them out to tell the flight attendant what I wanted to drink. They are very comfortable, I can easily wear them for 3-4 hours without experiencing discomfort. The bass is not "thin" on the ER-6i at all. By the same token, it is not boomy. It is tight and extends low, yeilding a very natural sound, and at the same time you can almost "feel" the impact of the low notes. The midrange is articulate and detailed, you hear everything that has been recorded when listening with these monitors. The treble is crisp, clean, a bit relaxed and not too bright. The ER-6i sounds great straight out of any portable music device. Overall, their sound yeilds a very neutral response which can easily be customzied to each individual's liking with an eq. Personally I think they sound great just the way they are. If you are looking for a moderately priced hi-fidelity headphone to use in noisy environments, these are the ticket. From what I understand, they will give you 95% of the performance of the Etymotic ER4P, Shure E4C, and Ultimate Ears Super.fi 5pro for less than half the price. Highly reccomended. Headphone.com is a great dealer, quick shipping, informative website. No experience with etymotic. Totally blocks external noise; very good sound. This is a review of the 6i's, which I bought for my iPOD. This was a great choice for 2 reasons: 1) they provide better sound than the ear buds that come free with the iPOD (in comparison, the Apple ear buds sound tinny, with no bass), and 2) they totally block out external noise. The latter was very important to me since I use my iPOD predominantly when commuting on a train or when traveling on a plane, two very noisy environments. Are they as good as my open air Sennheiser's? No, but I did not buy them to use with my home stereo. If you want great sounding ear buds that are better than what come with your MP3 player, especially for noisy environments, then these are for you. If you're looking for an audiophile set of headphones for use at home, then these will not do the trick (but again, that is not what I bought them for). Not much, getting better. Could have better manual. Very, Very clear. Small, unobtrusive. No outside sounds. Just not musical. A bit too "electronic" sounding. Lacking of warmth, feel, soul. Sony, Phillups, Akai, Panasonic, Name Brands, House Brands, cheap from $9.99 to "crazy" at $39.99. And now this retailed at $149.00 to #169.00. Crazy! -excellent low end -small and weightless so very portable. -can take a heap of low end eq with no distortion. -sound isolation yeah, yeah it's great. -a bit expensive...but what else are you going to buy? -needs eq'ing for huge sound but it is possible thank god. this review is for the 6i. i wanted something that sounded like my sony drv 700dj's for when i ran, worked out or just traveling without being enormous. and i have to say these sound as full and rich as a quality full ear monitor with the right eq'ing. i recieved them and was kinda wowed by how small everything was...which was good. i didn't want something any bigger than it had to be. i followed the instructions for ear insertion (critical for big sound.) you do have to moisten them first... so i licked 'em thinking the women in my life have licked my ears and i liked it. anyway, the sound isolation was on point as per the rest of the reviews. i pluged them into my mp3 player and started to play some hard rock. at first i noticed a little more low end. i was disappointed to say the least but then i realized had a heavy eq at about 100 hz for the earbuds i had previously used that came with the player. i started to mess with the eq in the 80 hz range for my low end. no distortion. "good" i'm thinking. definitely better. i then went to 60 hz thinking these little things can't get any better. well, no distortion. i went to 40 hz, maxed out the q and huge sound. i can't belive i'm listening to them right now and not my studio monitors. this is an amazing product for certain people for sure. i know many people aren't willing to shell out $150 for earphones but for those who's soul wont let you hear anything else but the best, pick up some of these bad boys. i have my srs setting on my mp3 player (iriver h10 20gig) at 40 hz and the q just maxed the fug out. sounds huge. i love it. i work out avidly and i'm stationed in japan with no car yet and man my walks around here have gotten to be way more of a pleasure. awesome product. -sennheiser's that came with my mp3 player -sony drv-700dj -all kinds of ear buds that i can't remember 'cause i was a child. This review is for the updated ER6i...specifically for Apple's iPod. To begin, the sound quality is excellent for a small, portable earphone. The clarity of vocals is superb as is the details in recordings. The foam ear pieces (which you roll and then insert into your ear) fit my small ears best and give a tight fit which, in turn, gives me an incredibly balanced and neutral sound. All the frequencies are there...including the bass...but I still like to use the "bass boost" EQ on my iPod. The bass is just a touch heavy for my taste with this EQ setting and I certainly could live with no EQ as well...It just depends on the music I've selected. The highs are there in a nice crisp fashion and the vocals, again, are right on the money. The output level is better than the supplied Apple ear buds and my volume is never more than 3/4 but usually just more than 1/2. The triple flanged ear pieces didn't fit my ear as well and had absolutely no bass on my first insertion. After putting the pieces well into my ears, the bass improved, but nowhere near as well as the foam pieces. The upside to the triple flanged pieces is washability and convenience. The downside to the foam is non-washability and dirt from your fingers goes straight into your ears. Convenience of use is a downside as well because there is a little preparation to make sure the pieces have a good seal in the ear...it's worth the sound and noise isolation but everything has a price, right?! The isolation is fantastic. I routinely use mine leaving the office in midtown Manhattan at 5pm and enjoy not hearing a single car or horn during my 10 minute walk home. This is quite a feat! My only concern with the isolation is that I really am isolated (aurally) from the outside world. I just hope I don't need to react to somebody's horn in an emergency. I'm very happy with them overall but don't look forward to having to remove them and reinsert them in the case of needing to communicate with someone. I did an A/B comparison with the Apple ear buds and there is just no comparison. This is what sold me on the ER6i earphones...If you can afford them, doing a comparison will certainly cinch the deal. I've rated this as a FAIR DEAL because the price is high and the quality seems appropriate for this price. They're not a steal but they are a VERY GOOD PRODUCT that does what they're intended to do. To sum things up: A great sounding product which is a huge improvement over the standard ear buds...they're just not "throw 'em in your ears and your done" and go. *Excellent isolation *Good sound, gets much better when driven properly by a headphone amp.. especially in the low end. *Sound quality is a bit less than er4s but the price is much nicer. The other reviews have pretty much covered the bases.. these earphones are excellent for airplane travel or any noisy area as they provide excellent isolation and good sound quality. As the other reivewers have pointed out, proper insertion of these earphones is essential. If they are not properly inserted they will sound awful.. very tinny with little to no bass. Also the er6 sounds much much better when used with a headphone amplifier. If you plan on using them without a headphone amp I would suggest the er6i higher impedance version of these phones. In my opinion these things can't be beat for travelling, exercising or listening in any other loud environment. The er4 series do sound a bit better but I can't justify their price for what I use them for. For home use I much prefer an open air phone like allesandro/grado. Not as clear, or full, as the ER-4S (but it IS half the price!) Thin wires makes the produce feel/look fragile Requires that the earplugs be inserted deep to get a good seal/sound. Body of plug is smooth, which makes getting a good grip difficult. I had to pull on the wires once to get the dang thing out of my ear (I was tying to get a good seal). I was looking for some ultra-small headphone/ear plugs that would deliver full sound with isolation for plane travel. I had been using a set of Sennheiser HD 202 which are a great value and solves the "at work" environment, but it is very difficult to travel with full-size headphones. A co-worker introduced me to the Etymotic ER-4S earphones. I was very impressed with the clarity of the sound, but was not impressed by the price tag. So I decided to try out the ER-6 earplugs that run about 1/2 the price. When I got the package I immediately noticed how tiny these things are. For $100, you sure don't get a lot in a physical sense. The wires are very thin, and the set looks and feels fragile. I'll have to remember to treat these with care. That said, these earplugs do deliver exactly what I was expecting: sound clarity less than the ER-S, but far superior to any of the cheap "earbuds" out there. When used on my ipod the volumne needs to be at 80-95% in order to drive these earphones. The bass and mid-range (yes, bass) is full while the high-end is a bit harsh - especially on female vocals. I noticed that this harshness goes away if the volumne is decreased, and I suspected that I'm seeing a limit to the ipod's drive capability. To verify I listened to the same MP3's using my SB Live, and the sound was so much clearer with no high-end harshness. My conlusion is that I may need to pick up a portable amplifier in order to really make these earplugs shine. On side effect I wasn't expecting: For the first time, I noticed imperfections at MP3's ripped at 128k. I now am ripping at VBR 128k-192k, which sounds a lot better. Overall conclusion: These earphones deliver less than the ER-4S (as expected), but far exceed the performance of any of the open-air earbuds out there. If you're looking for good sound, but don't want to pay for a $300 solution, the ER-6 is a good compromise.